De La Salle University-Dasmariñas (DLSU-D) conferred an honorary degree, Doctor of Humanities (Honoris Causa), to His Eminence Luis Antonio Gokim Cardinal Tagle, D.D. The solemn ceremony was held on 19 June at Ugnayang La Salle of DLSU-D. The conferment of the honorary degree is in recognition of his achievements and meaningful contributions to the DLSU-D community. Cardinal Tagle generously and selflessly served as one of the members of the Board of Trustees of the University from 2005 to 2012. Even after serving as Bishop of the Diocese of Imus, Cardinal Tagle continues to inspire and motivate the academic community through the excellence he constantly exhibits and the simplicity and humility that he consistently exudes. 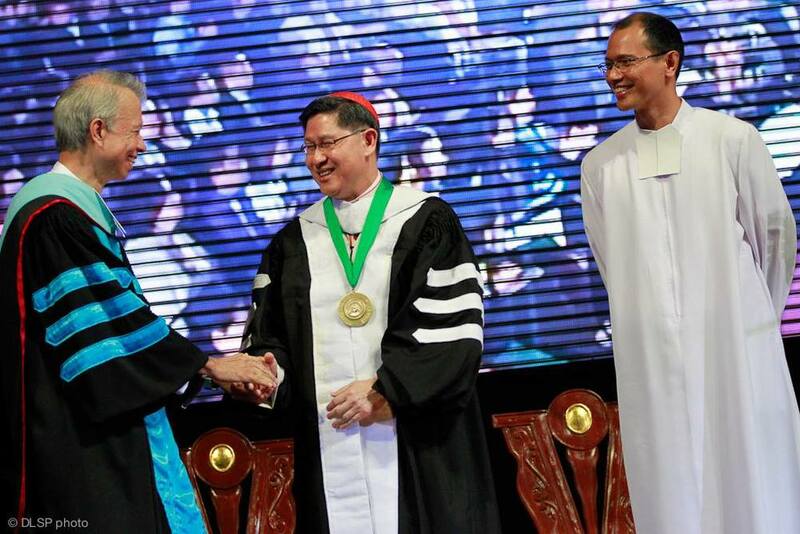 The Medal of St. John Baptist de La Salle was also awarded to Cardinal Tagle during the same academic convocation. The Medal is given as a gesture of esteem and appreciation for His Eminence’s valuable contribution as Pastoral leader, in his capacity as former Bishop of the Diocese of Imus, and as now Archbishop of the Archdiocese of Manila. It is also in appreciation for his commitment and support in advancing the Lasallian mission towards making a difference in the lives of countless persons.